I managed to get three possible leads this week and ended up pursuing one that involved interrogating the deceased bishop's nephew. First you investigate the house that he stays at but it actually took me a looooong time to find what I needed – in fact, it took so long I had to rely on a hints guide and there's a really good one by Spaz McBomb on Steam (in the end, the solution was to simply look up...). Later on, you end up pursuing this nephew (after you've collected enough clues) and you spend most of the time playing as a dog named Toby. 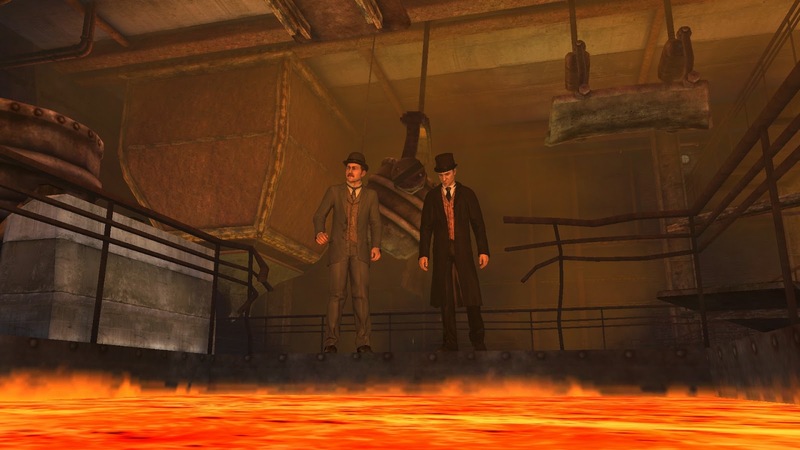 Unfortunately, when coming across the nephew, you happen to do so in what looks like a foundry – not the safest place to have a friendly chat. The nephew accidentally falls into the molten metal and that's the end of that. One lead down, two to go. I've noticed that the game has a lot of puzzles, so much so that it feels like a whole bunch of mini-games/puzzles stringed together by the occasional dialogue between Holmes and Watson – the game might actually appeal more to pure puzzle game fans than the typical point 'n' click adventure gamer. As promised, I made sure to put in a bit more effort with Company of Heroes 2 this week and I've now completed both Mission 10 and Mission 11 from the single-player campaign. Mission 10 involved breaching the walls of a castle in Lublin, Poland. It took some time to encircle the city (about an hour) before I could finally bring up the ISU-152s to breach the castle gate… and then all hell broke loose. My squad consisted of the original troops at the beginning of the game with only a couple of extra units so I had a light tank, a flak track, an MG crew, Shock Troops, a mortar team and a couple of SU-76s – which wasn't that good against the droves of armor that they threw at me; thankfully, I managed to breach the castle gate in the nick of time to finish the mission. In mission 11, you play as Polish partisans attempting to stealthily capture an informant. Their reward? Execution by firing squad. Harsh. I can now see why the game is deemed controversial and why Russian sales were halted by publisher 1C back in 2013. Your character Isakovich does protest about the harsh treatment and threatens to report the truth, but instead gets sent to a penal battalion. Mission 12 involves taking the Poznan fortress. I managed to complete Chapter 3 this week and now I'm seven levels into Chapter 4. Each chapter the game re-invents itself and introduces you to new goo balls - in this one they're virtual goo balls and you can actually direct them to jump from structure to structure. You also get introduced to building blocks in this chapter (yes, the humble building block) as well as a funky level that requires you to use a planet to perform slingshot manoeuvres. I'm once again stuck on one of the levels though and this one happens to be a doozy: in the puzzle, you're required to get your goo balls to the exit pipe that is situated in the top-right corner, however the goo ball structure is precariously situated on a see-saw - so too much weight one way or the other will result in game over man, GAME OVER!